What a beauty! 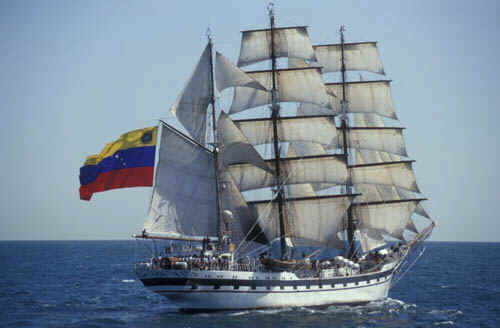 The Venezuelan Navy Training Vessel, the tall ship Simón Bolívar, will dock at the Nassau Harbour August 22-26, 2015. The ship will be open to the public for tours from noon until 6:00pm on August 22, and from 9:00am to 6:00pm on August 23-25. A welcoming ceremony for the arrival of the vessel is set for Saturday, August 22 at 11:00am. Earlier this summer, the vessel stopped in Jamaica, Barbados, Belize and Cuba as part of the first stage of the crew’s 27th Caribbean training cruise, which began in Venezuela. The visit to The Bahamas is part of the second stage of their training cruise, which began on July 27. This stage includes visits to Honduras, Cuba, and St Lucia. The Simón Bolívar was built in Bilbao, Spain at Astilleros Celaya and launched in 1979.